You have to look twice before you realize that this traditional red gumball machine is really made from a terra cotta pot, a terra cotta saucer and an ivy bowl. You can use it to dispense gumballs or small candy – all you need to do is lift the terra cotta saucer lid and help yourself! 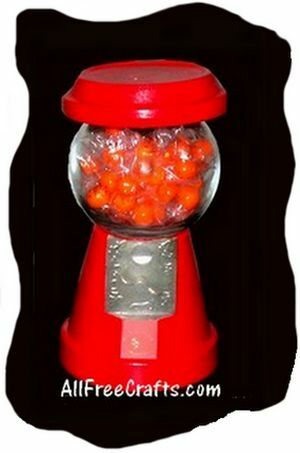 Why not offer some of these nostalgic faux gumball machines for sale at your next bazaar? You may also wish to see another version of this craft – the Jack O’Lantern Candy Jar for Halloween. 1. Apply paint primer to all surfaces of the terra cotta pot and the saucer. Let the primer dry, then apply red gloss paint to all surfaces. Alternatively, cover the primer in red craft paint then spray or paint with a gloss sealer. Let the paint (and sealer, if using) dry completely. 2. Turn the pot upside down. Apply a bead of clear silicon caulking around the bottom of the ivy bowl and center it on top of the pot. Push the ivy bowl firmly into place and weigh it down with a book or other heavy object until the glue dries completely. 3. Print the gumball machine front and cut closely around the picture, leaving no extra white at all. Glue this to the front of your gumball machine with white glue. 4. Fill the ivy bowl with gumballs. 5. Place the red terra cotta saucer upside down on top of the ivy bowl. 6. Invite grandchildren to try a gum ball or offer a free sample at your next craft bazaar sale.